Asda are currently doing 1Ltr bottles of Pimms for £10. Got a bit excited there. At first glance I thought it was 10 Ltrs for £1. Still, it's Pimms O'clock for me. I hear that Aldi's equivilent is just as good. 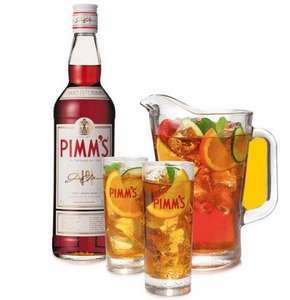 Can't beat a bit of pimms at this time of year, great deal, just got home from Asda wish I had seen it. Good deal since the 70cl bottle is £12.00! It taste's like Pimms.. But great price, i'll be buying several. Picked up a bottle at lunchtime, excellent deal. Co-op were selling the 70cl bottle for this earlier in the month. You heard wrong...it's not. Heat added. Nah, I'd say maybe sangria? Great offer!Love Pimms and lemonade or pepsi! For anyone without an Asda nearby Tesco are doing it at £20.29, therefore using the return the difference policy you could get 10.29 back. Ace. Just picked up 2 bottles. Fantastic price. Shame there's no Asda near here, I'm waiting for Morrisons to do this offer like they did last summer. I've not tried Jeeves(Lidl) or Austins(Aldi) myself so can't comment on them. But at £10 for a litre of the original, i'll stick with what i know ! Could you buy this from Tesco at the higher price and get double the difference back as per their price promise? If so you could end up with £20 free shopping!